When you purchase and install a full computer protection suite, like Norton 360, it comes with many more options for protecting your computer than a simple anti-virus program. 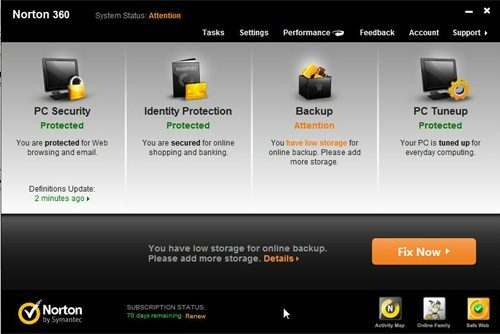 Norton 360 includes a utility that will clean up unnecessary files from your computer, it will automatically back up crucial files in the online storage that you receive with your subscription, and it installs a powerful firewall application that protects you from malicious attacks from the outside world. 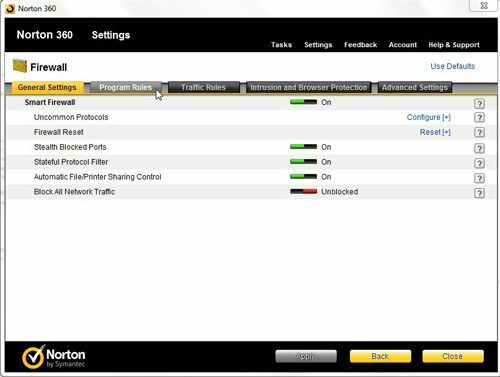 You can even configure your Norton 360 firewall settings to best protect the data being sent to and from your computer. Many people think that an anti-virus program provides adequate protection on their computer, but a firewall is just as important in securing your data and keeping dangerous people from accessing your information. Unfortunately, sometimes the Norton 360 firewall is a little too effective and blocks program activity that you actually want it to allow. This is particularly true of programs that you might use across a local network, like Quickbooks. I know that I would much rather have the Norton 360 firewall settings erring on the side of caution, so it is not an inconvenience to go in and manually allow a program to access the network. Once you have installed the Norton 360 program and, along with it, the Norton 360 firewall, your computer will begin displaying a Norton 360 icon in your system tray. 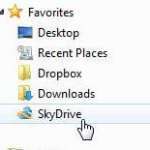 The system tray icon looks like a yellow square with a black circle inside of it, but will also display Norton 360 when you hover over it. Double click this icon to launch the Norton 360 window. This window is the location from which you manage everything that Norton 360 does on your computer. You will note that Norton 360 is giving me a notification that my online backup storage is low, which means that I need to either change the items that I am backing up from my computer, or I need to purchase more online storage from them. 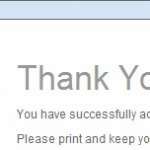 For our current purposes, however, we will need to click the white Settings link at the top of the window. This opens a new Norton 360 window with a list of the detailed settings that you can adjust. We need to click the Firewall link at the left side of the window. To change the Norton 360 firewall settings for specific programs, the next action to perform is clicking the Program Rules tab at the top of the window. This displays a list of all the programs on your computer for which there are currently firewall settings in Norton 360. Scroll through the list of Norton 360 firewall settings for your programs until you locate the program whose settings you want to modify. Click the drop-down menu at the right side of the window under Access, then click the setting you want to apply to that program. Your options include Allow, Block, Custom and Auto. If the Block option is set for a particular program, then that program cannot access the Internet, which could cause it to behave improperly. If you know the program to be safe, then select the Auto or Allow option. 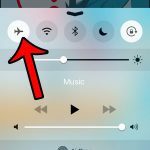 Once you have finished adjusting your settings, click the Apply button at the bottom of the window. If prompted to do so, you should then restart your computer. 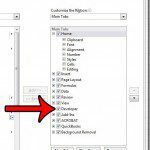 Where is the Developer Tab in Excel 2013?